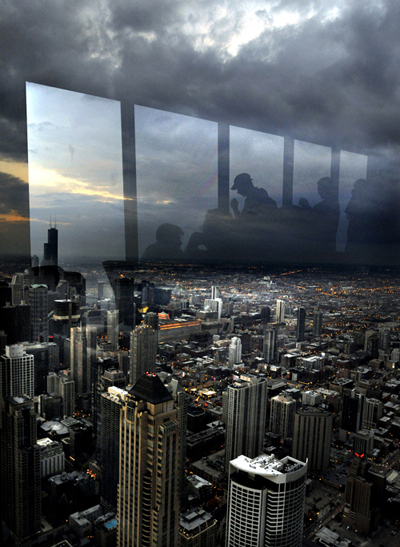 A silhouetted view from the Signature Room in the John Hancock Building in downtown Chicago. Chicago River Cruise docent Syma Dodson leads a Chicago Architectural Foundation tour showcasing the city's most stunning buildings. 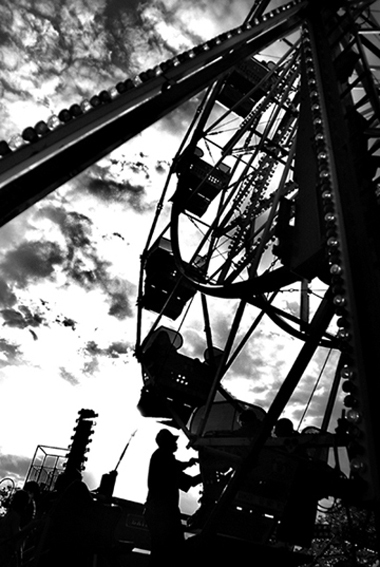 A ferris wheel operator lets people off the ride during the annual Railroad Days event in Franklin Park, Ill.
Corn Bingham is a vendor on Maxwell Street in Chicago. 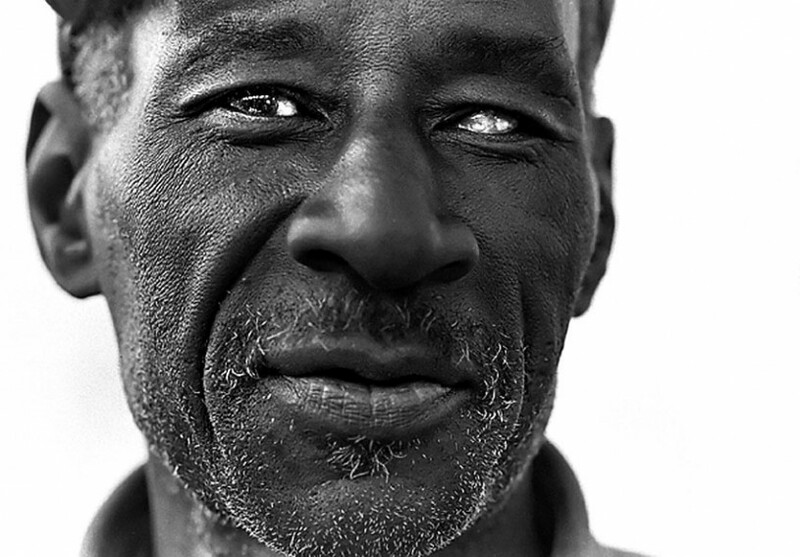 Bingham has been working on Maxwell Street every Sunday since the early 1970's. 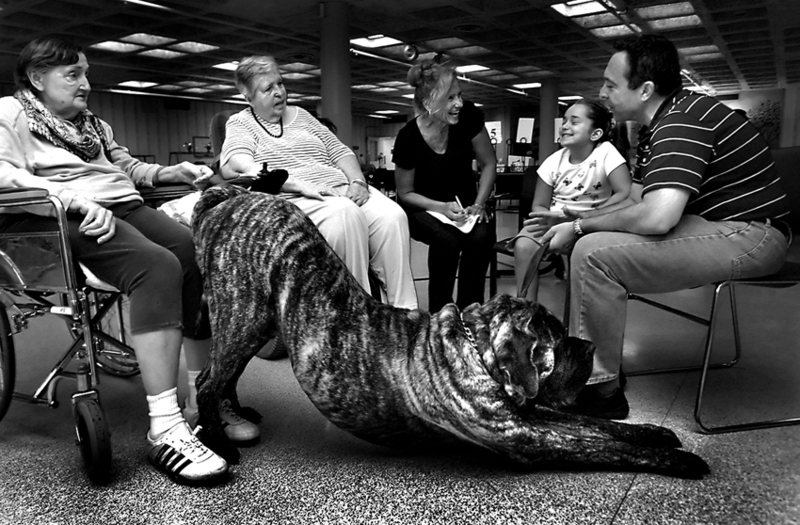 Titan the therapy dog stretches before walking the halls of the Winchester House, a long-term health care facility owned by the Lake County government in Libertyville. Shown from left to right, resident Gloria Omahana, resident Monica Behnke, Volunteer Coordinator Mary Purnell, and owners Nicole and Ed Benyukhis. 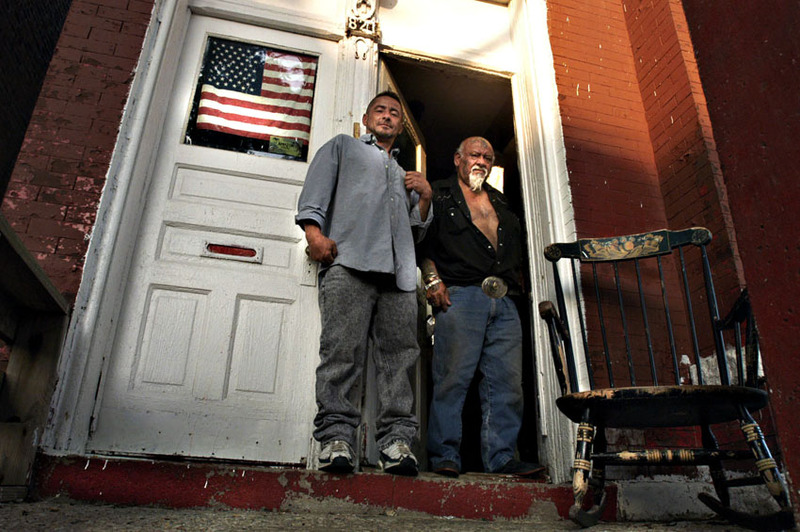 Daniel and his father Florentino Briseno (right) are residents of 821 N. Francisco Ave. in Chicago. The Briseno family has lived in Chicago's Humboldt Park neighborhood for more than 25 years. 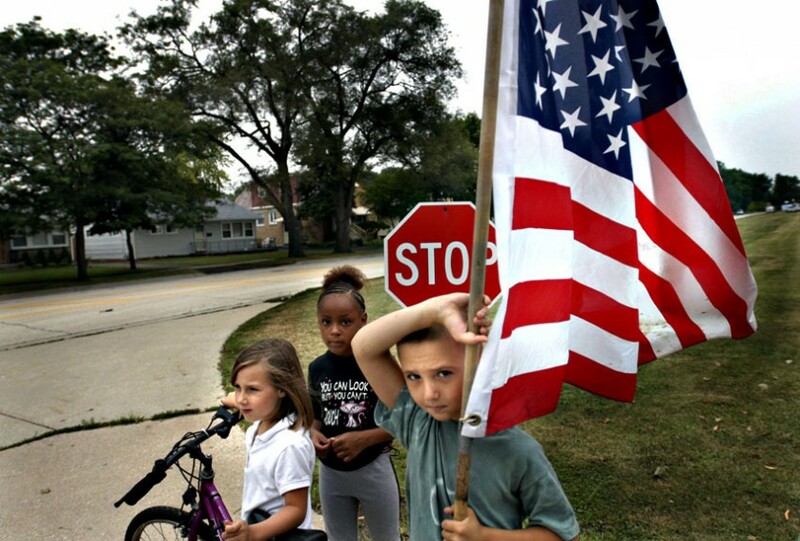 Children wait in Hillside, Ill., for a bus to arrive with family members returning from the war in Iraq. 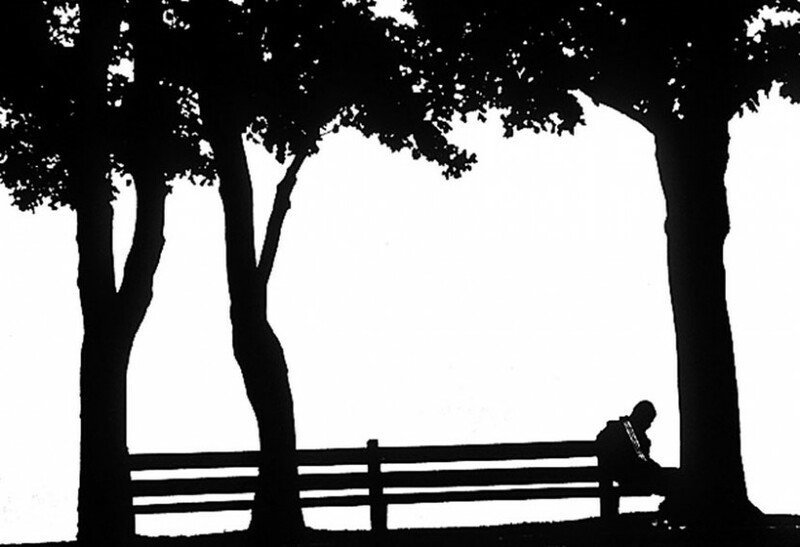 A jogger rests on the lakefront near North Avenue Beach in Chicago. 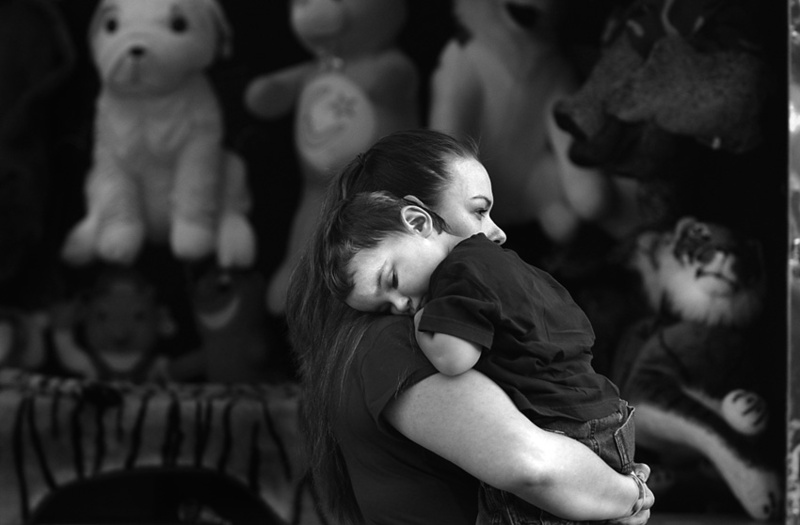 Dana Sadovi carries Andres Stiglich, 2, through the St. Helen School Festival in Chicago. Children gather on the front porch of a home on Houston Street in the West Mannheim community of Franklin Park, Ill. West Mannheim is an overcrowded, largely Latino section of the suburb. 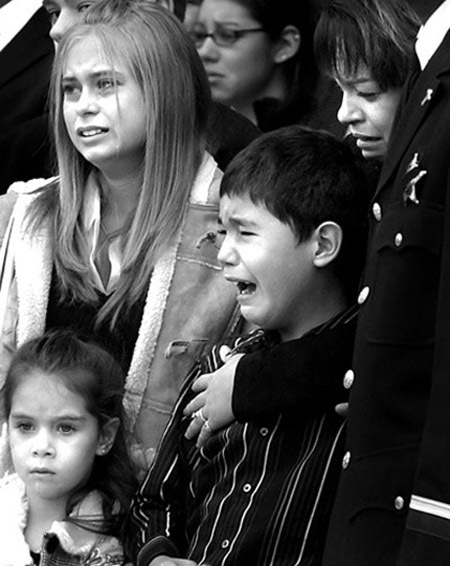 Family members mourn as the coffin of Maywood Police Officer Thomas Wood leaves a church. Wood was shot and killed May 23, 2007, while sitting in his patrol car in Maywood. The case is unsolved. 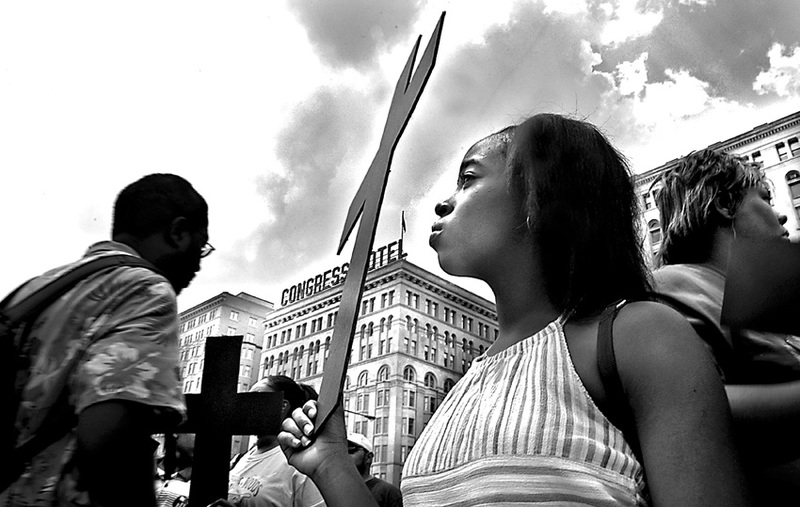 Myesha Coley, 13, of Ninos Heroes Academic School, attends a rally and prayer service in downtown Chicago held to remember students killed while enrolled at city schools. 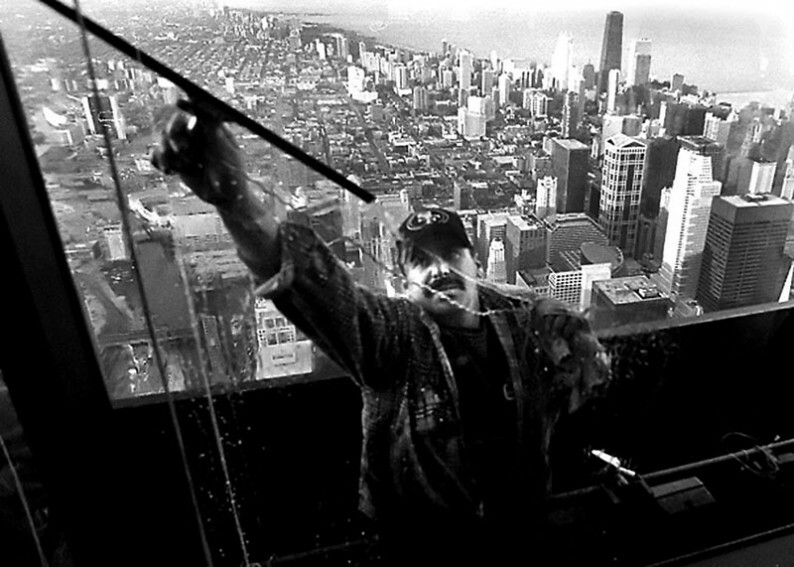 A window washer cleans outside the Willis Tower Skydeck. 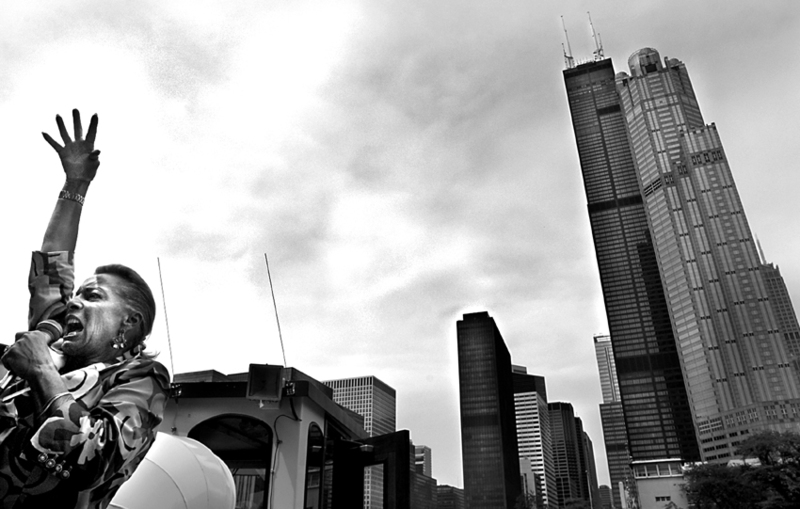 At 1,353 feet, the Skydeck is the tallest observatory in Chicago. 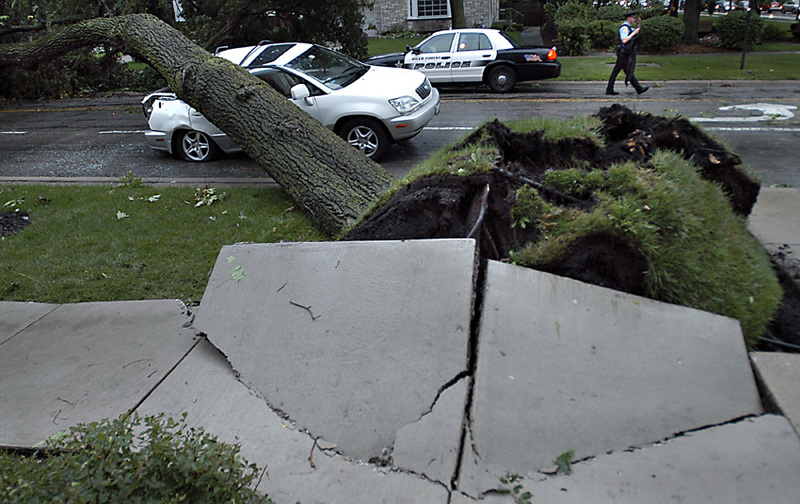 Samantha Hinners and Kyle Magnus kiss outside the Liberty Theater in Libertyville, Ill.
An uprooted tree in River Forest, Ill., crushed the back of Forest Park resident Larry Warner's car while he drove south on Lathrop Avenue during a storm. No one was injured. Jose Ramirez-Sanchez runs his father's corn and fruit stand on the corner of 6th Avenue and Lake Street in Maywood, Ill. The stand is open everyday, and also sells churros and fresh mangos. 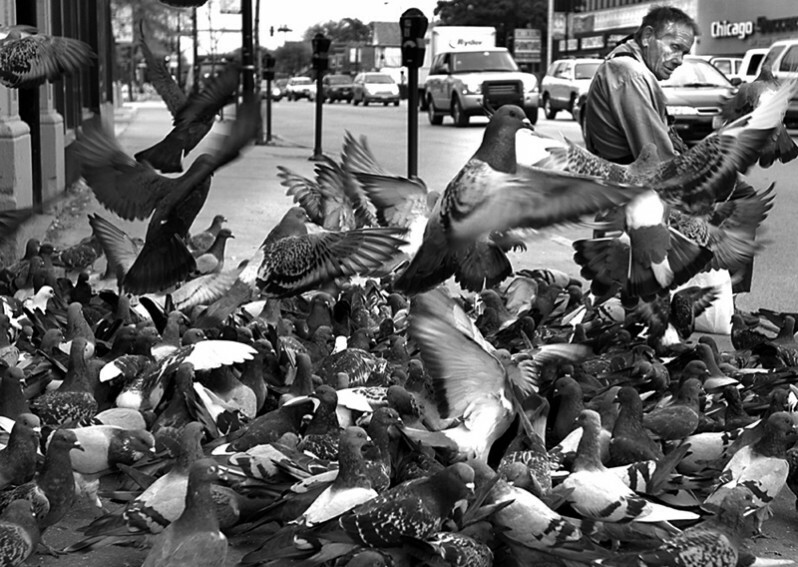 Joseph Zeman, also known as the "Pigeon Man" of Logan Square, sits with his birds on the corner of Lawrence and Western avenues in Chicago. Zeman was hit by a car and killed on Dec. 18, 2007. 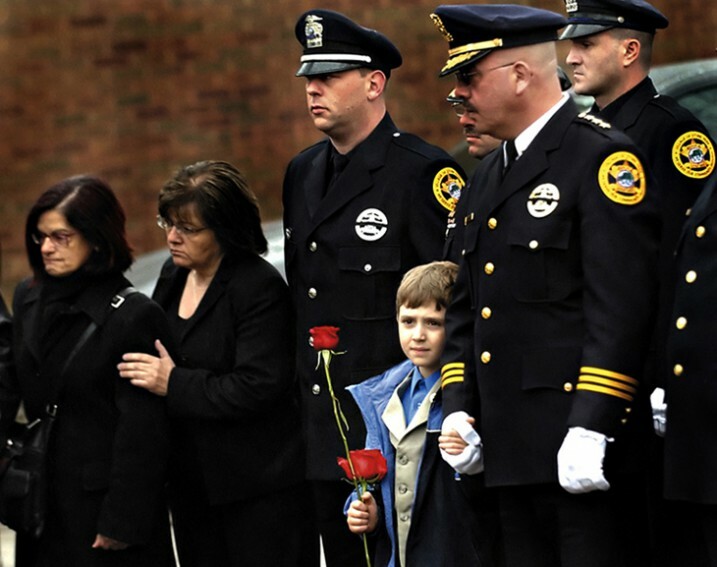 A Stone Park police officer holds hands with Luciano Mazzulla, the son of late Police Officer Ivano Mazzulla. Mazzulla's funeral was held at Our Lady of Mount Carmel Church in Melrose Park, Ill.